Before I knew it I was being sucked in and there was no going back. There wasn't even a spot to stop and assess. I was in the thick of it and "it" was pushing me around like a washing machine. Cars, lorries from all directions suddenly had me pinned in the centre and were forcing me, unapologetically, from one lane to the next. Where did they all come from? How did the flow change so quickly? I had no idea what was going on and it seemed no one else did either judging by the sudden lane changes and chaotic nature of the flow. I tried to assess the situation and it looked like we were heading for a bottle neck. Everyone was determined to get there first. The biggest man wins and, as a 250cc motorbike, I was looking and feeling pretty insignificant right now! I was being taken for a ride, like it or not! When I could I fought my way to the hard shoulder. At least they could not attack from the right. I pulled in just before the toll, took a deep breath, reset the Garmin and, against my better judgment, dived back in. Like I had a choice! My ride had been fairly uneventful since leaving the Bulgarian border 5 hours previously. I had waved goodbye to Lesley and Ian, my hosts at the Bulkan View in Granitovo and headed through the border, safe in the knowledge that I had all the paperwork I needed to sail through having been there the day before to sort insurance and get my visa stamped. Unfortunately, as I had technically been through the border once already, the kindness of the border police the previous day was now causing some confusion. "Were is your exit stamp?" "Well technically I didn't go through into Turkey. I just came to sort my paperwork out in advance"
"You were not allowed to enter?" "No. I mean yes. I didn't actually want to enter yesterday. I came to sort my paper work. They didn't tell me I needed an exit stamp"
I had come over the day before as I was staying only 15 minutes away and having read some stuff on the internet I was not sure if they would take my Bulgarian Lev as payment for the insurance or if they would accept my online visa confirmation from my phone. I didn't want to waste time in the morning heading back so I had decided to take a trip over the afternoon before while there was no time pressure. Lesley and Ian had ridden over with me and we had actually had fun WALKING through into Turkey and chatting to all the guards as we went. Now there were lots of head shaking and confused looks. Eventually I was told to park my bike and come with them. "Where would you like me to park it? I can’t turn around"
They eventually got the row of cars behind me to reverse and took me off to one side before leading me to the office where I was presented to what appeared to be the boss. I have no idea what was said but I just kept smiling and eventually I think he told them off for wasting his time and I was sent on my way again. Five more little windows later (where I had to remove my helmet and produce my documents) and I was on the road and into Turkey. From there I had one long straight road to Istanbul and an address to aim for somewhere near the Bosphorus on the European side. I made it to within 5k of Kemal's before giving up and calling him. He wasn't sure where I was and I was not doing a very good job of explaining, so eventually I handed the phone to one of the petrol attendants and asked him to explain. "Please tell my friend where I am"
It worked and Kemal made it within 15 minutes. In the meantime I managed to navigate my way through a bag of cheesy Doritos and a RedBull. 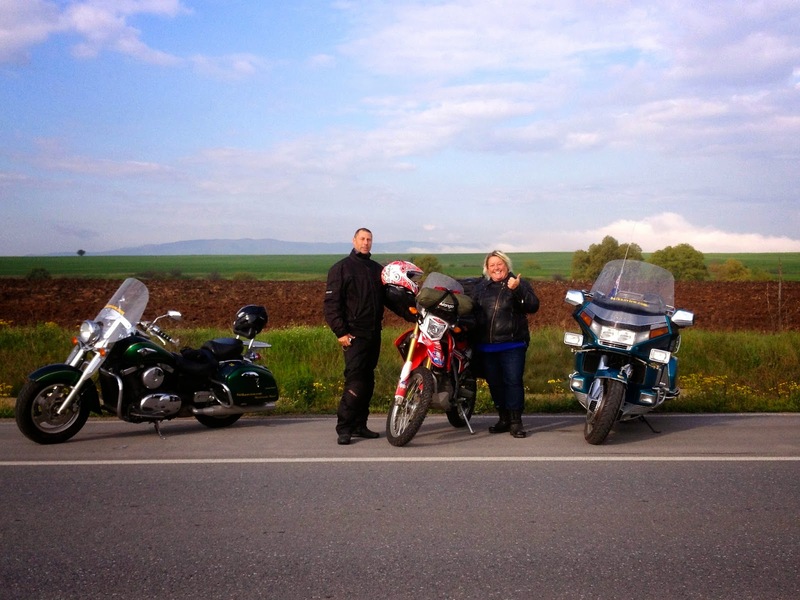 Love reading about your true adventures in motorcycling! You couldn't possibly make this stuff up!!! I should have signed my comment. While my technology skills are practically nonexistent, I'm very comfortable on my motorcycle! Lol, great stuff to read, Steph. This is were it is all about, so nice. Enjoy and take care! Really, We realize how technology is important in our life, especially In this type of circumstances ;-) But I enjoyed your blog. Trip on a motorcycle is a good plan for true adventure but always carry tool kit with us.